There's a gimmick with every themed restaurant and the latest addition to the San Gabriel Valley is one that may leave you either offended, entertained or both. Private Party, a reference to China's Communist Party, is a new Communist Chinese-themed hot pot restaurant laden with propaganda-inspired posters as well as waiters dressed in head-to-toe garb as Mao Zedong's Red Army soldiers. The ingredients are very fresh and the hot pot broths are quite tasty, especially the tomato broth. The skewers on the hot pot are a good idea in theory, however, it is difficult to gauge when a skewer is thoroughly cooked. Of all the seafood and meat options, the pork belly is a standout. Each slice is meticulously hung on a wooden board for presentation. 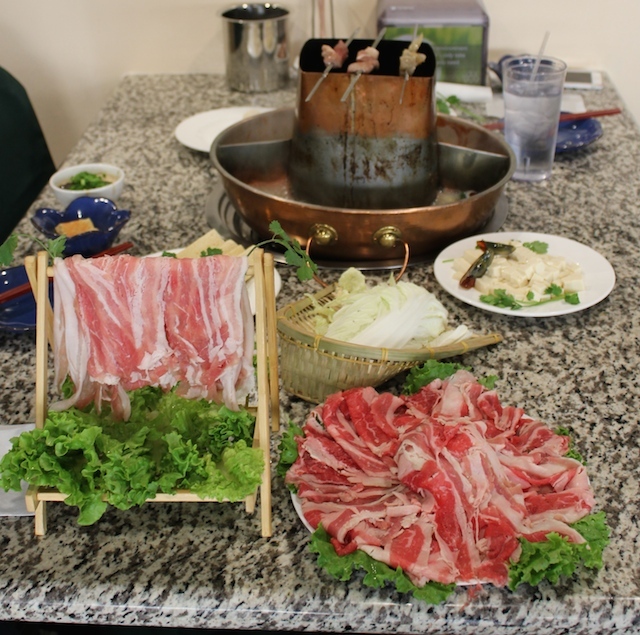 On top of the extensive sauce collection, Private Party also has three seasonings—cumin, salt and spicy mix—that go well with the hot pot ingredients. And it's not just hot pot either, there are also appetizers like tofu and thousand-year-old egg, noodle dishes, as well as dessert on the menu. Staying true to the Beijing theme, Private Party also serves Beijing yogurt, which is sweet and sour in taste and very soothing after a hot pot experience. Private Party is located at 111 N. Atlantic Blvd. in Monterey Park, (626) 872-0599. It's open daily, 11 a.m. to 11 p.m.
Don't forget to follow me on Instagram for the latest in food news in Los Angeles, the San Gabriel Valley, and beyond! Oct 29 Hot Pot for Chilly Nights!